While Texas A&M is known as the “Home of the 12th Man,” it appears as if the term “12th Man” (as a reference to a team’s fan base, student section, or alumni) has been used prior to the famous 1922 Dixie Classic. 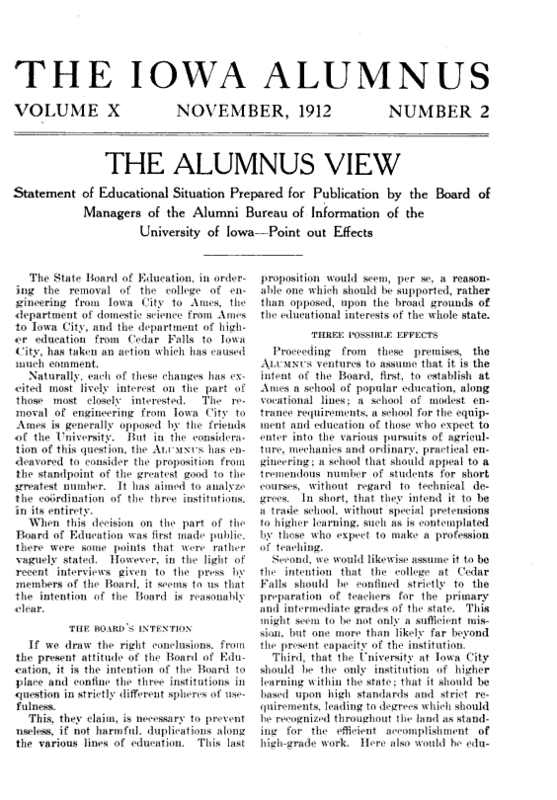 In a 1912 issue of “The Iowa Alumnus,” E.A. 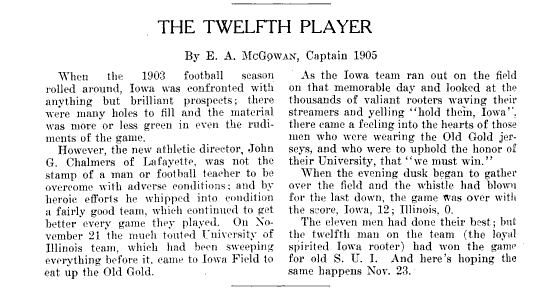 McGowan (captain on the 1905 Iowa team), recalls the 1903 Iowa victory over Illinois. You will notice that he gave credit to the “twelfth man on the team (the loyal spirited Iowa rooter)” for the victory. *Note: I believe S.U.I. stands for State University of Iowa. Click HERE to see the entire publication. When the 1903 football season rolled around, Iowa was confronted with anything but brilliant prospects; there were many holes to fill and the material was more or less green in even the rudiments of the game. However, the new athletic director, John G. Chalmers of Lafayette, was not the stamp of a man or football teacher to be overcome with adverse conditions; and by heroic efforts he whipped into condition a fairly good team, which continued to get better every game they played. On November 21 the much touted University of Illinois team, which had been sweeping everything before it, came to Iowa Field to eat up the Old Gold. When the evening dusk began to gather over the field and the whistle had blown for the last down, the game was over with the score, Iowa, 12 ; Illinois. 0. The eleven men had done their best ; but the twelfth man on the team (the loyal spirited Iowa rooter) had won the game for old S. U. I. And here’s hoping the same happens Nov. 23. This entry was posted in Aggie History, History, Texas A&M, Tradition by Travis Normand. Bookmark the permalink. Nope! Sorry! This is out and out heresy and as a fundamentalist Aggie, I refuse to even read the article. I mean, how do we know that the good people at Iowa State didn’t develop a time machine in the future, steal the term and take it back in time to give it to the fans of that program? Huh? You can’t prove that didn’t happen. hahaha….yeah, I kind of felt the same way.